I have written a series of programs in C to look at the climate data. I took the most complete data set available, published by Berkeley Earth Surface Temperature, and changed it to record the station information as quarterly averages, using the method explained in Part 3. A famous region that looks rectangular on Mercator is Colorado. 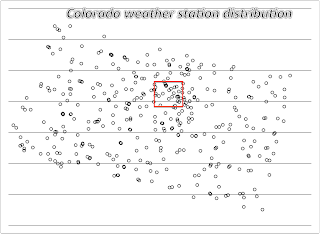 Using all the weather stations that reported any data from 1955 to 2010, we see the state doesn't look quite rectangular. This is because turning longitude and latitude into x and y coordinates factors in the curvature of the earth. The state is pretty well covered, which is the case for much of the land in the Northern Temperate Zone, the most populated region on earth. The density is greatest around the red rectangle, which corresponds roughly to Denver and its suburbs. 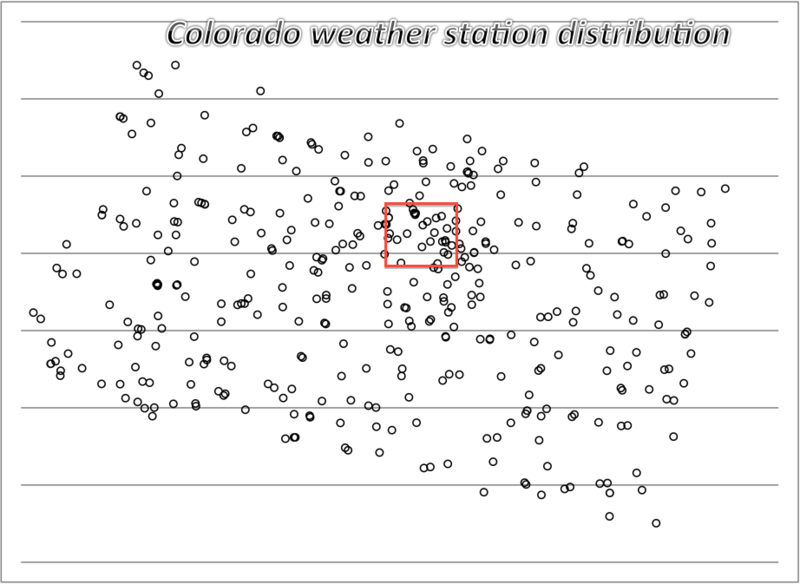 My system imposes a 10×10 grid on the region and each grid point adds in the data per season from the nearby stations, weighted by distance. This is an effort to even out the sampling somewhat. Even so, some grid points will get more data in their sample, so a map to show the relative strengths will be included in any report. What that grid looks like will be the topic of tomorrow's post.